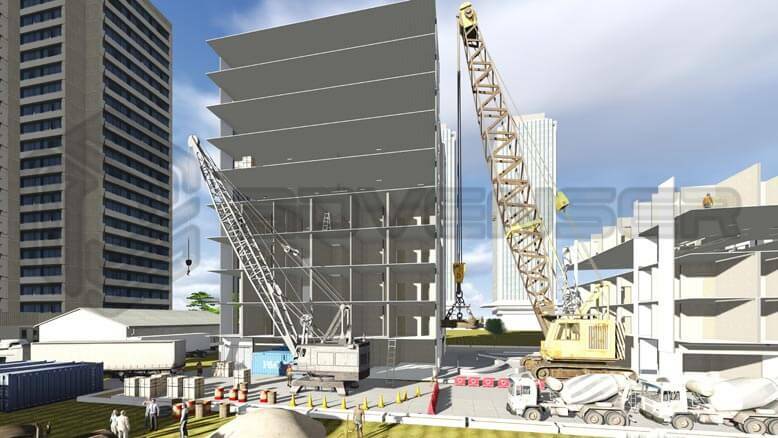 Building information modeling (BIM) can be utilized by the general contractor in collaboration with the design team and sub-contractors for generation of constructability reports, coordination, planning, scheduling and cost estimate. The GC can subsequently use the BIM model for clash resolution among all services, and extract shop drawing as well. The specialty contractors can then use the information from Building Information Model to prefabricate the required products offsite. Advenser offers a full suite of cost-saving BIM services for construction management. Whether Shop drawing, Offsite fabrication drawing, Construction simulation, Onsite BIM management or 4D & 5D simulation, we can help you get the job done faster and more efficiently. Extraction of 2D shop drawings from the BIM model increases the accuracy of the drawings and eliminates the need to re-create information based on design interpretation. Since clashes removed virtually, it reduces the likelihood of conflict in the field substantially and consequently reduces the time needed for the review process. The increased accuracy of shop drawings. Fabrication drawings are produced for pre-fabrication or manufacturing of off-site materials and components. Fabrication drawings need to be provided to the manufacturer prior to the commencement of on-site construction and approved by the design consultant in charge of the project. Spool drawing is also generated at this stage along with a spool map, which is essentially an assembly of pipe and components that are fabricated in the workshop and then shipped to site for erection. 4D refers to the intelligent linking of with schedule-time constraints and 5D with cost-related information. The generation 4Dand 5D models allow the various project stakeholders such as architects, designers and contractors to visualize the building before construction and track the work progress & cost over time. This vastly enhances the project efficiency and increases profit. Simulation allows stakeholders to visualize the construction phase of the project virtually and helps enhance construction sequencing. It acts as a spontaneous visualization tool for the spatial or sequence constraints in the construction schedule and thereby shortening the time needed for reviewing or correcting the schedule and improves the collaboration and coordination among all parties. One of the unique challenges in executing a successful BIM project is the effective collaboration of all parties involved in the project such as architects, designers, general contractor and specialty contractors. Advenser provides the option of a dedicated full-time in-house BIM coordinator stationed at your project site wherever that is. This coordinator who possesses the necessary managerial as well as technical skills and experience attends all onsite and online coordination meetings at the site and manages the modeling team offshore.